The statistics are staggering. The population is looking at alternatives to help heal their joint pain. The current administration of NSAIDS comes with a long list of side effects. 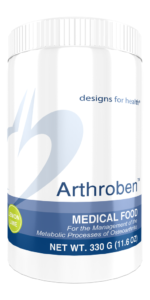 The most effective professional grade product to treat joint pain and OA is Anthroben. Flavocoxid is a proprietary blend of the flavonoids bai- calin and catechin that was shown to be as effective as naproxen in managing knee osteoarthritis and produced improvements in 87% of patients. type I collagen. These ingredients boost anabolic processes in connective tissues and provide building blocks for all collagen in the body. VERISOL® (like FORTIGEL®) stimulates anabolic processes in connective tissue. We carry Anthroben at The Organic Compounding Pharmacy. We strongly believe in this product and guarantee it’s effectiveness. We even use it ourselves! Come visit us to give it a try.